Conferință de dezbatere în Senatul României – întalnire cu autoritățile despre problematica hipertensiunii arteriale. Acțiune de măsurare gratuită a tensiunii arteriale, în corturile special amenajate în incinta spitalului Colțea, unde bucureștenii sunt așteptați să își verifice valorile tensionale și să se informeze din surse avizate despre pericolele și metodele de prevenție a hipertensiunii. Scopul principal al acestei campanii este de a atrage atenţia asupra prevalenţei crescute a hipertensiunii arteriale, de a educa populaţia cu privire la importanţa controlului permanent al valorilor tensionale, ca instrument de diagnosticare precoce, dar și de a informa persoanele cu hipertensiune despre importanța menținerii sub control a acestei afecțiuni. Click aici pentru prezentarea post-eveniment. The campaign’s goal is to raise public awareness about the risks of high blood pressure, encouraging the practice of early diagnosis and prevention methods. The main objectives are to increase the number of people regularly checking their blood pressure, of those who adopt a healthy lifestyle to prevent the occurrence of hypertension, and to increase the number of people with hypertension who follow the correct prescribed treatment. The campaign goal is to raise public awareness about the risks of high blood pressure, encouraging the practice of early diagnosis and prevention methods. The campaign includes a series of public events dedicated to people suffering from high blood pressure, doctors and local authorities. 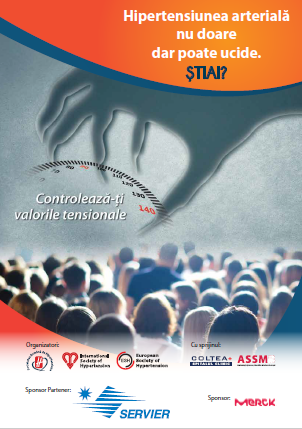 In 2012, Romanian Society of Hypertension has made three blood pressure measuring tests and three public events. The first action took place on 14 May 2012 in the Senate. 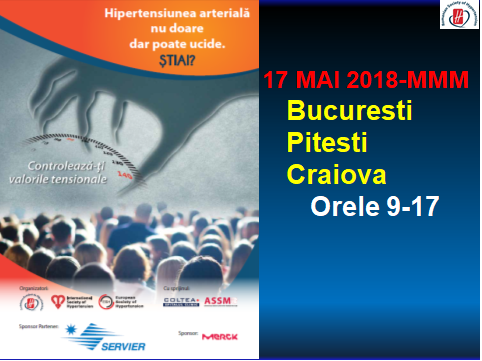 The purpose of this action was to draw attention to hypertension as a public health issue in Romania. The event was held in co-organization with the Senate Commission for Public Health. The second action took place on 17 May, World’s Day fight against hypertension. For this action, a tent was placed near Coltea Hospital and all participants had their blood pressure measured for free. People identified with hypertension received useful medical advice from the specialists invited to the event. The third action of blood pressure measurement campaign in 2012, was held on 23-24 June 2012 in the Union Square in Iasi, at the first International Conference of the Romanian Society of Hypertension. 1229 people had their blood pressure measured for free and received useful medical advice from the specialists invited to the event. The campaign’s goal is to raise public awareness about the risks of high blood pressure, encouraging the practice of the correct methods for early diagnosis and prevention. The main objectives are to increase the number of people regularly checking their blood pressure, of those who adopt a healthy lifestyle to prevent the occurrence of hypertension, and to increase the number of people with hypertension who take the correct treatment. Blood pressure measurement campaign from June 23 to 24 in Iasi was held with the support of the City Hall.